The countdown is on for my girls to return to school! Although we don’t have a ton of supplies to purchase, we are in a whirl-wind to get our house organized and cleaned up from summer’s fantastic chaos. I really just want to spend their first day of school focused on them (while I enjoy a clean house filled with golden silence for 3 hours). 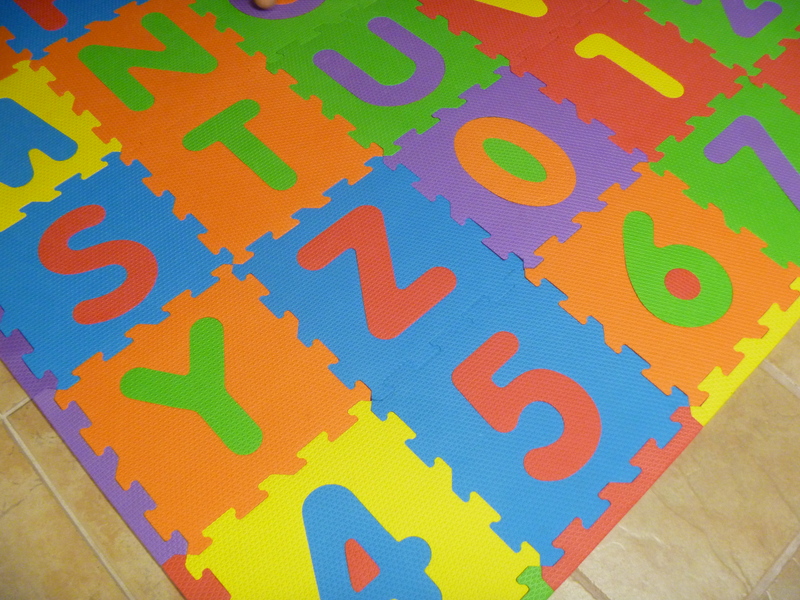 How many of you have a puzzle mat like this? Such a pain to clean right? I vacuum ours each week, but it is just due for a bigger cleaning. I polled a few other moms for advice. The results are most everyone tosses it outside to hose off, tosses in the tub or in the dishwasher. I don’t have a dishwasher. (You can pick your jaw up off the floor now). With two rambunctious threenagers dominating my household I don’t have a lot of time to spend hunched over the side of the tub. There has to be an easier way, right? I asked Google. They had nothing. I even perused Pintrest and no spark. It felt like I was in pioneer country here. Why not try the washing machine? I did and it worked so much easier! Pull off the border pieces and pull apart the squares. 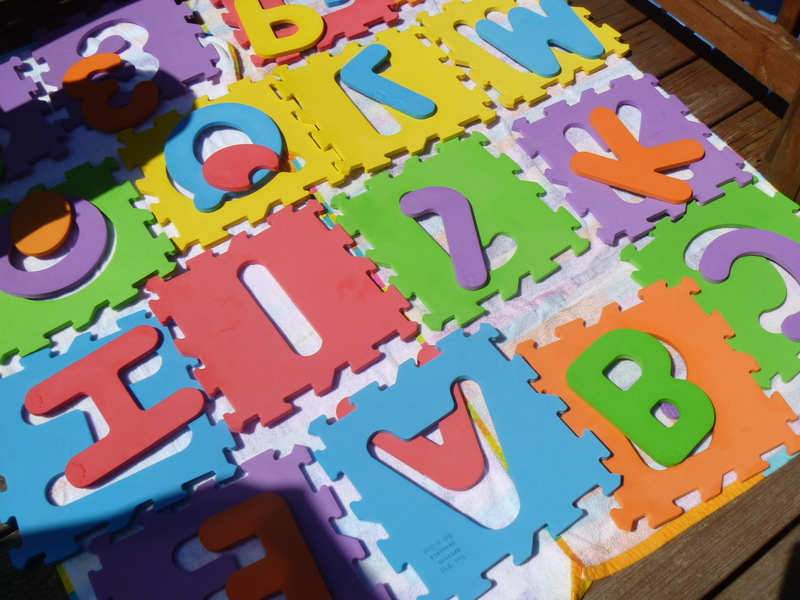 Be sure to leave the letters and numbers inserts intact. 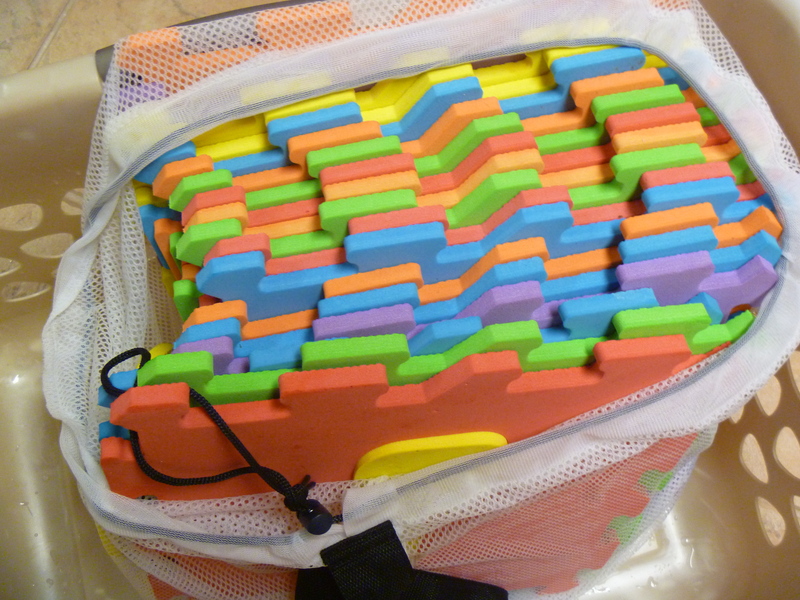 Put the border pieces and half of the squares into a large laundry bag (we use this one to carry our toys to the park). If you have a large washer and can fit all of them in at once more power to you! Mine did not. 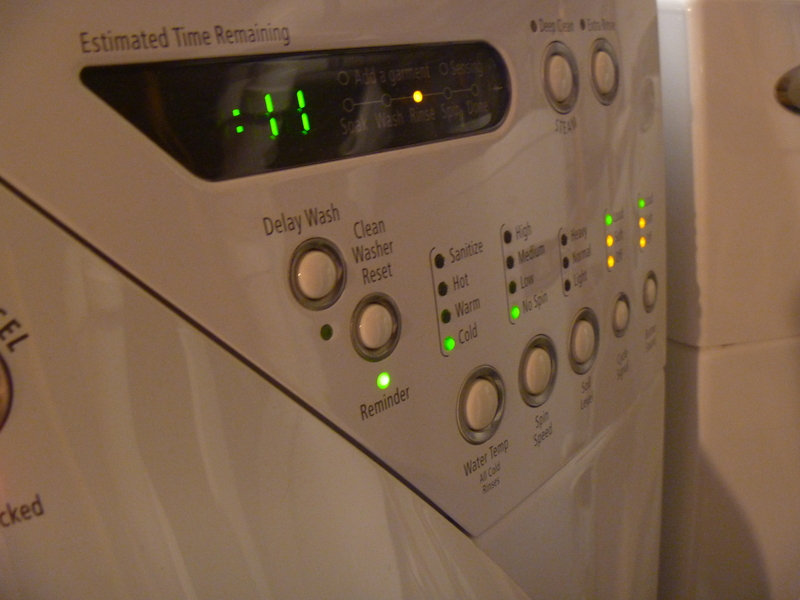 I have a rinse option on my machine. I ran an 11 minute cold rinse with no spin at the end. I let the pieces dry face down on towels in the sun. I pulled the inserts out to be sure everything dried completely. It took less than 10 minutes each ‘load’ to dry in the sun. In less than 45 minutes I not only disassembled, washed, dried and reassembled the mat- but with the machine doing all the work I was free to do other things. Like, vacuum up the crud and mop the floor underneath the mat, fold the laundry and do some dishes. 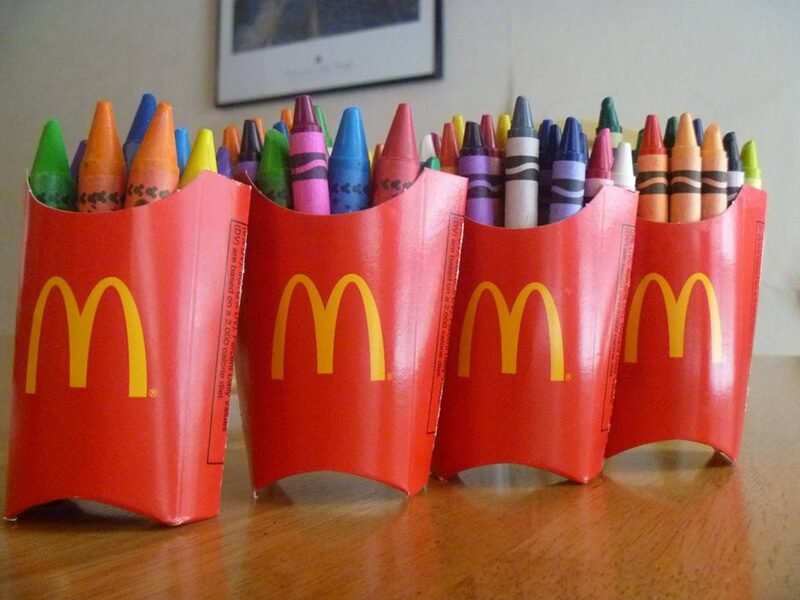 French Fry crayon holders. Sharing is hard for my girls. Especially when I place the one big box of crayons on the table in front of them. 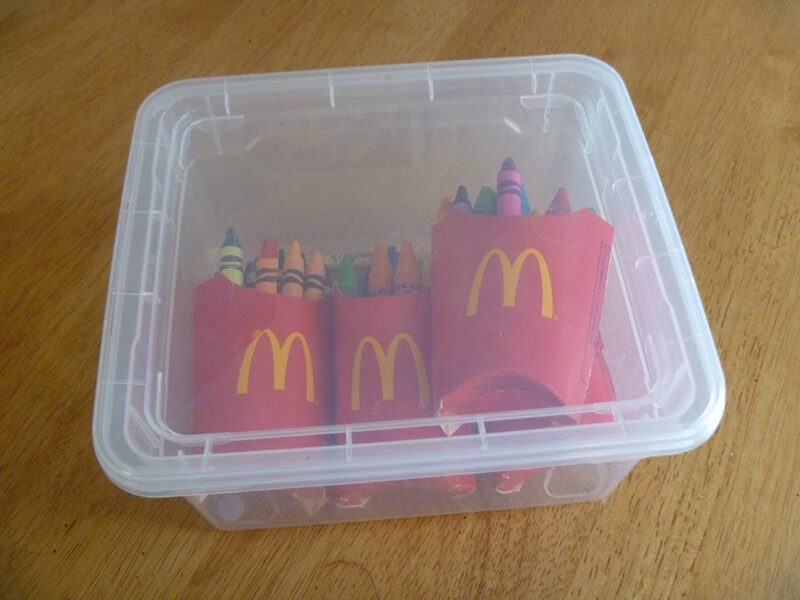 So, I use the kid sized french fry boxes from their happy meals to divide up their crayons. Now they can each have their own box without any argument. (Ah…I almost hear my inner peace calling). Disposable cookie sheets found at the dollar store (usually two in a pack) are great for containing messy projects. If we ever use glitter I put one of these trays underneath. 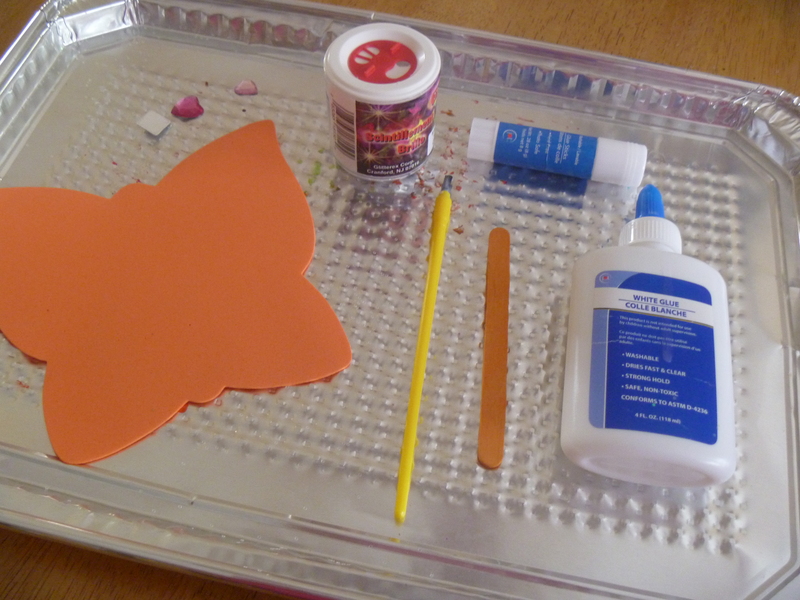 They are also great for projects that require paint or glue. Last, this is my fave, and maybe too early to use so tuck this idea away for the next couple of months. 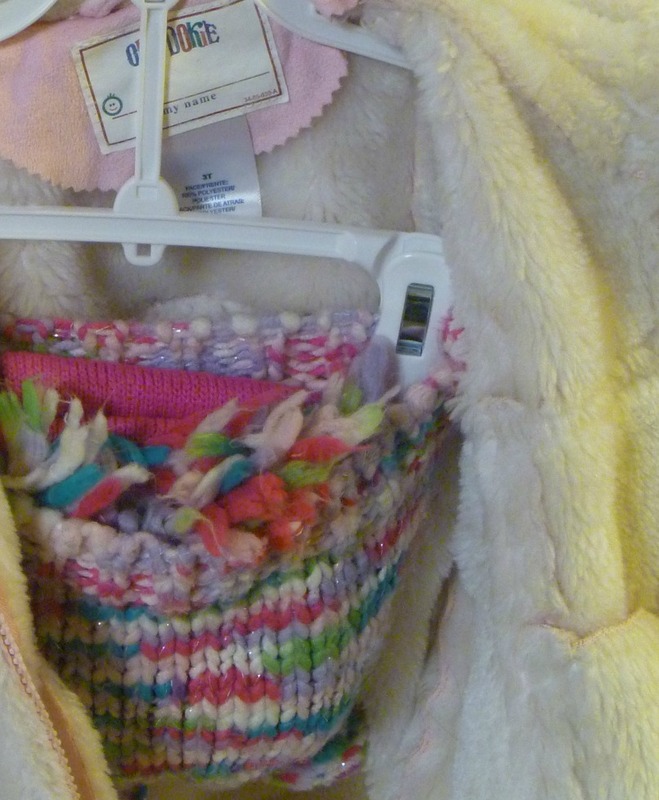 Don’t throw away those little kid hangers that come with a two-piece outfit. 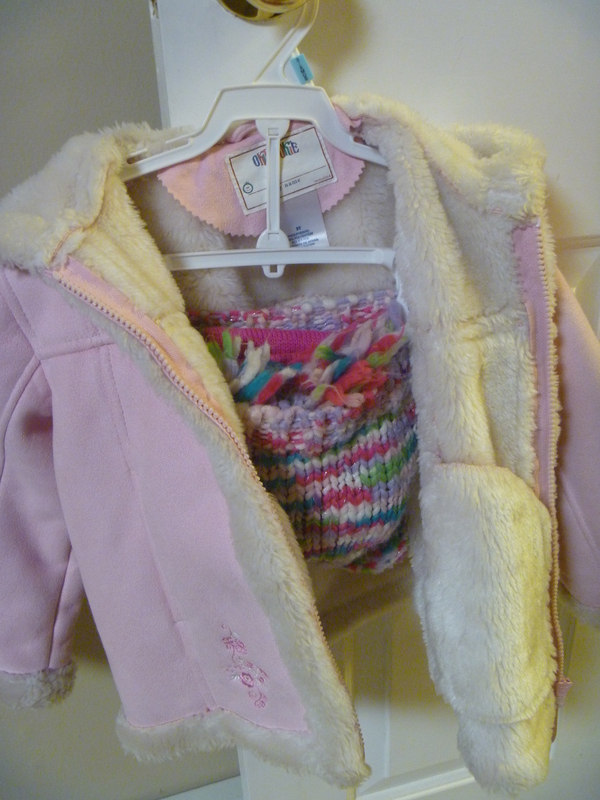 These are great for hanging your kids coat, hat, scarf and gloves all in one easy-to-find location. I use the clip to hold their hat with a scarf and gloves tucked inside. It has been such a huge time saver not having to rummage through the hat box when we get ready in the winter! So there ya have it. Some quick little hacks to help you keep your Whatever cool! What is your favorite parenting hack? My son Luke will be turning 11 this week. I started this blog a year ago and have found it somewhat therapeutic sharing my thoughts where he has been the nucleus. I just sent a text message to Luke that I will share with you, and then I’ll explain. The message was “Morning Luke! Remind me that I have to talk to you later ok? I love you”. •	The biggest flaw? My soon to be 11 year old will not be able to read this text until his 8 year old brother makes him aware of it. Like most people who decide to have children, our lives changed dramatically when we had Luke. It will change many times over in that timeframe, and most days, I got it all covered. There are some days, like today, that I do not. We have seen Shane outgrow Luke to an extent. It was tough to accept. Yesterday, the beginnings of that scenario reoccurring took place. Luke and Cole have been a team all year. Cole looks up to Luke like a little brother should. Every night after dinner Shane and I shoot the basketball around in the driveway. We ask Luke and Cole, but they usually say no. Recently, Cole has been showing an interest in basketball and when he opted for dribbling in the driveway instead of playing “Slugterra” with Luke, the look of confusion on Luke’s face was then tattooed on my brain. So much so, that I am thinking about it 16 hours later. I think I have come up with a remedy. I will take Luke’s imagination and rekindle mine. I used to love playing out scenario’s from my favorite television shows when I was kid. Whether it was the Dukes of Hazzard, Star Wars or G.I Joe, my mind was always going. That might be the best birthday present I can give him. My advice to anyone who will listen. Life is full of flaws. Hell, I am severely flawed! Don’t get wrapped up in what you think should be happening and enjoy what is actually taking place. I spend so much time thinking of ways to change or fix Luke when I should be devoting that time to how Luke is going to fix me. To anyone who is reading this. Thanks for reading the last year and thanks for listening. I know I’m not the only mom counting down the days till the start of school. 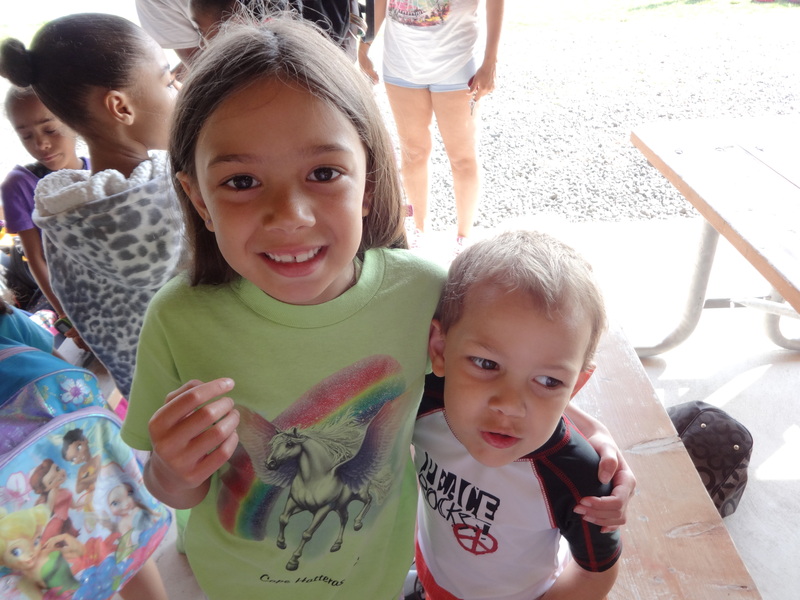 My older kids have really loved going to camp at our town this year, but it ended last week and I’ve been watching the days drag by ever since. I got used to having a nice chunk of my day with just me and Sydney. It has been bliss compared to this week. Thanks to mostly cruddy weather, my gang has been stuck inside for most of the day and Sydney has recently decided that she misses the womb and wants to spend every second on top of me to get as close as she can to her former home. Hannah and Jay on the first day of camp. On the plus side, I had forgotten just how many things I can do with one hand – open doors, cook dinner, shove laundry into the dryer, but my frustration level is going through the roof. Sydney has spent the better half of the last two days sleeping in the baby carrier while I do housework. My son loves the baby dearly, but he attempts to spend every second of the day touching and kissing her, even while I’m trying to feed her or while she’s crying her head off. I wish I could come up with things to keep my older kids busy, but the only time they like to play with toys is when they have friends over. That worked for two days this week when I watched my neighbor’s daughter, but now we’re back to watching TV, tattling on each other and finding new ways to torture each other. It’s sad when you look forward to the day you’re kids will realize that having each other is a valuable tool they can use to “get one over on mom and dad.” When they start working together, I know we’re in trouble, but lately I pray for that day to come quicker. Hopefully they will go to each other with problems they don’t feel comfortable coming to us with during those awkward teen years. I also hope that the secrets that they keep with each other aren’t ones that would cause too much damage. 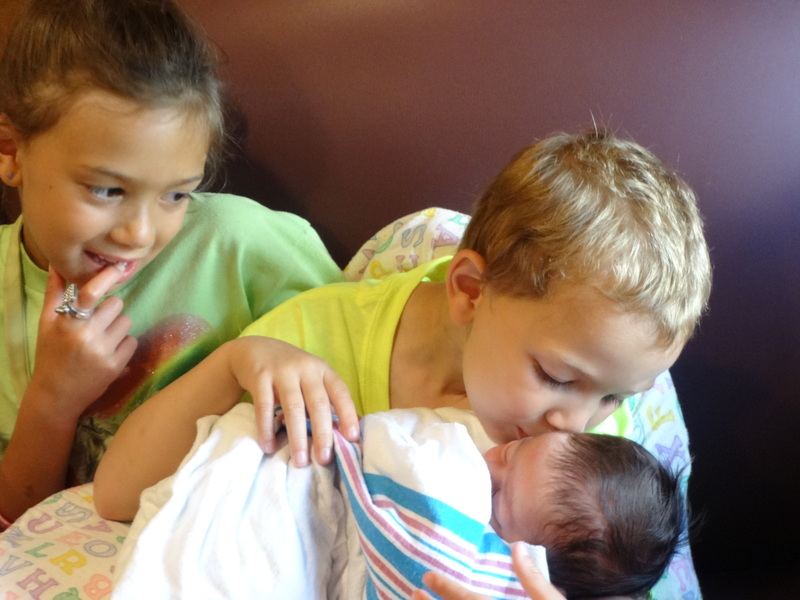 Sibling love at first sight. I worried how my kids would react when I told them I was pregnant with Sydney. They seemed fine about it, though excitement took longer to kick in. When they met her for the first time, it was love at first sight. The other day my son said to me at dinner – “Are we going to have more babies?” He pointed out that there was indeed one extra chair at our dinning room table. I can’t fathom it at this moment, yet I also can’t say with all certainty that it’s out of the realm of possibility. My husband did strike the deal with me before we decided to have a third that I had to be open to the possibility of having a fourth. I’ll admit for a few minutes at the fair a few weeks ago I took a mental note that Hannah and Jay can go on rides together and Syd will have no partner when she gets old enough. That’s a decision for another day -very far in the future. 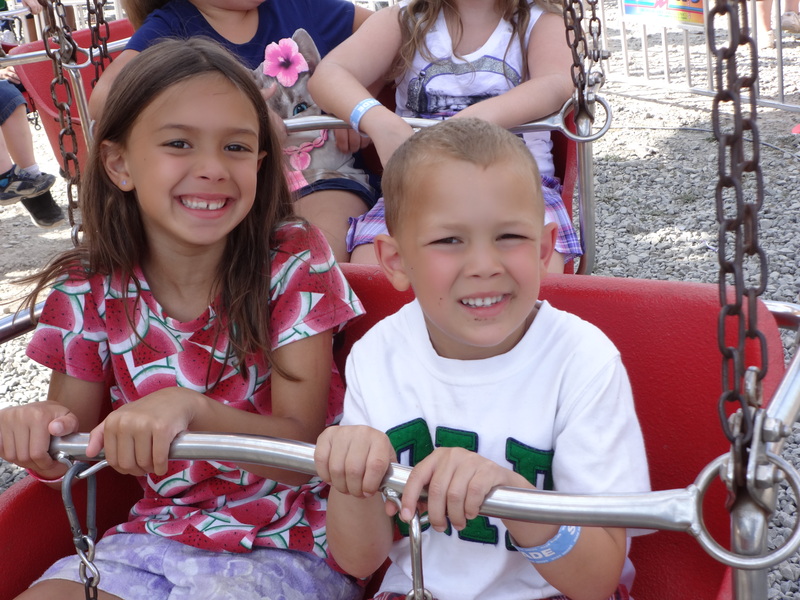 Ride partners at the Wayne County Fair. I can’t say I have a good relationship with my brother and my step-sister and I get along, but don’t see each other that often. Yet something truly changed my view on siblings while watching my husband and his sisters go through the loss of their mom. They were there for each other. They shared memories and comforted each other. When my own mother died I’d like to say my brother and I came together the same way, but we didn’t. Still having lost both my parents and my in-laws, it made me even more aware that some day (hopefully many many years in the future) my own children will lose us. When that day comes, I hope they turn to each other. I hope they share memories and stories and even make fun of us a little bit. They will share a bond that nobody else can. They are siblings by blood, but I hope they will be friends by choice. 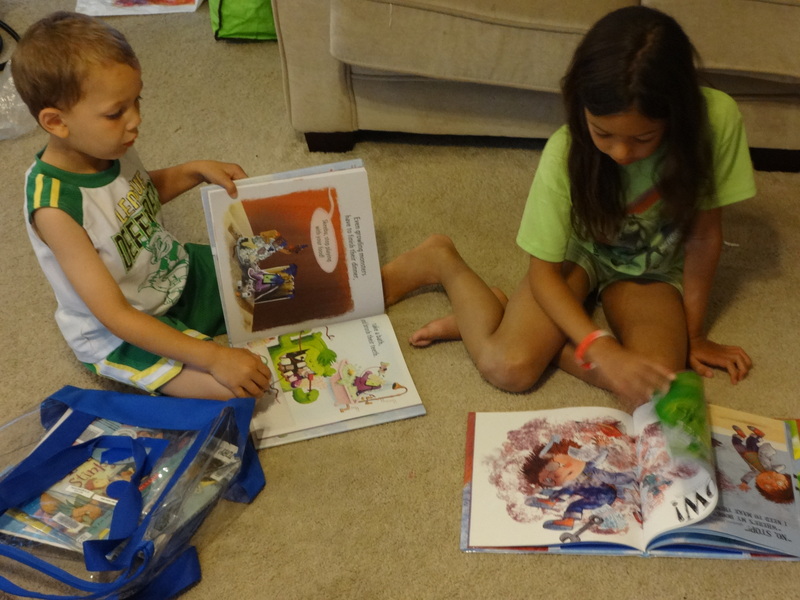 Hannah and Jay reading together. Somewhere in the midst of the chaos is love. I try to remind myself of this on days when they are fighting, yelling, and tattling. It’s a bond that they’ll have for life, even if they don’t always want it. I have to remind myself that the love is there, even when I’m frustrated that my son won’t stop kissing the baby long enough for me to feed her or my daughter is trying to help me “parent” my son. I need to listen for it in the laughter when they play nicely together. One day I’ll hear it when someone tries to be mean to one of them, and a sibling will stand up and defend the other. That’s what siblings are for after all. I think it’s what we all hope for when we decide to have another child. I’ll admit that sometimes I’m jealous of moms with only one child and the vastly quieter house they must have, but for me I know in my heart that the greatest gift I ever gave my children was each other. What a Luxury It Is To Be Anxious for 17 Years. My anxiety about turning 39 began on October 30th, 1997. I know that was 17 years ago, but I vividly remember sitting at my desk in my dorm room studying for an exam. The phone rang. It was my mom. “I’m sorry sweetie but Aunt Christine passed away.” My memory goes blank after that. I don’t remember what I felt or heard next. All I remember is she was only 39. My aunt Christine died from breast cancer. 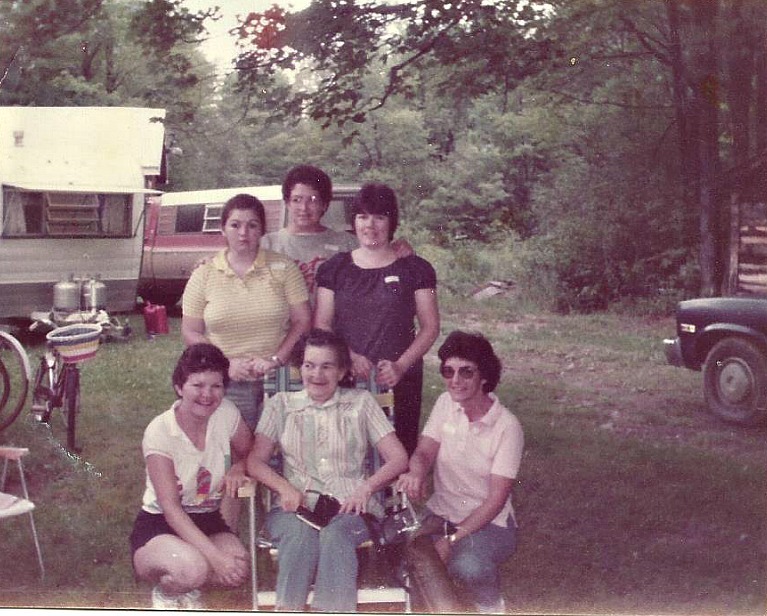 Cancer had already taken my grandparents (that I barely knew) and some of my mom’s friends I knew as “aunts”. But Christine’s passing was the first loss I understood and felt entirely. She was the sweetest and kindest person I had ever met. Until she passed I never knew what it was like to have regrets when a loved one dies. I grew up in a small town and ran into Christine at the A&P often or while she was out jogging in the neighborhood. Over the years I grew busy with attending college and working. Christine and I only exchanged snippets of conversation, and never had a chance to sit down and talk about life over a leisurely cup of tea. If only I knew then how important it is to make time for connecting with family. Cancer is a disease that just doesn’t know any boundaries. It doesn’t care who it takes or when. I have lost a number of family members to various forms of cancer. Last year I lost 2 friends to cancer; and this year 3 more have been diagnosed. 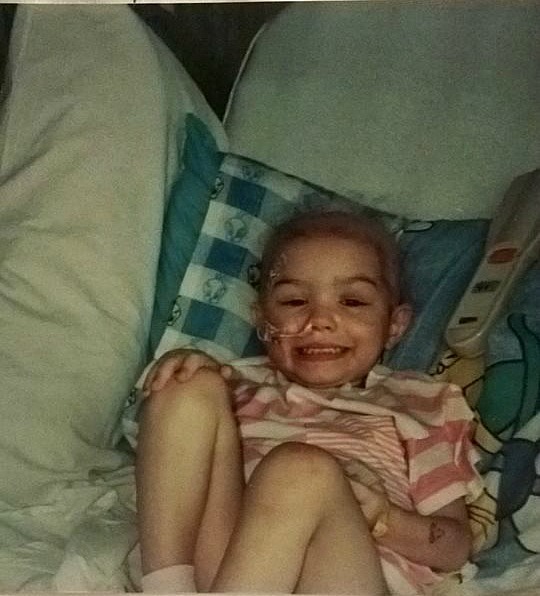 I followed the stories of 3 local children who all lost their battle with cancer. I watched my niece battle and win against Leukemia when she was only 3. That was a long and brutal time in her very young life. Most of my friends and family know that I am passionate about raising money for various cancer organizations. I’ve celebrated my last 17 birthdays by donating and raising funds for cancer support and research. Giving back on my birthday started as a way for me to honor my loved ones and is now how I celebrate the extra year life has given me. This year I’m going bigger. This year I turn 39. This year I chose to support the Jessie Reese Foundation for my birthday giving. This foundation began as the dream of a 12- year-old cancer patient as a way to give kids inspiration to Never Ever Give Up (NEGU). Courageous Cupcake Sales pay for Joy Jars, power packs and sibling packs for children fighting cancer. 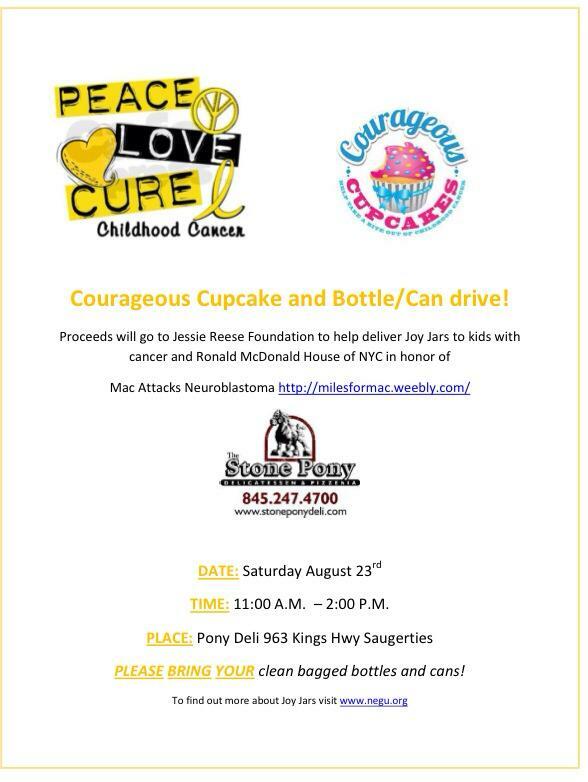 I am hosting my own Courageous Cupcake sale to help Jessie’s mission continue. 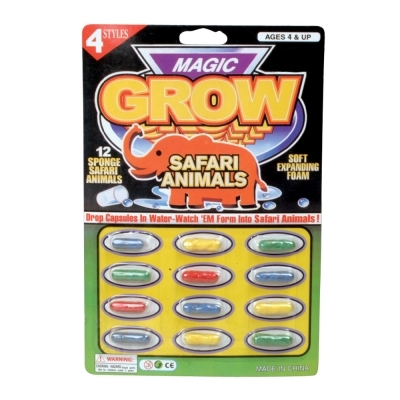 My goal is to raise $390 to buy 20 Joy Jars. With over 20 dozen cupcakes being donated I hope to surpass that goal! At the same time there is a special bottle/can drive happening. Proceeds will go to a local family who lost their little boy Mac earlier this year. It is their wish to honor what would have been his 3rd birthday with a donation of 35 lbs. of can tabs to the Ronald McDonald House. I’m not in the habit of asking for things, but this year I asked my husband for this beautiful bracelet for my birthday. Half the proceeds go to the Rocky Strong Organization. 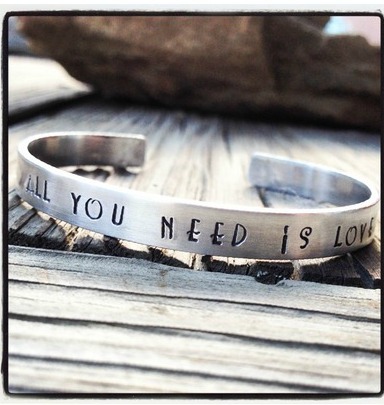 The bracelet was designed for a local woman, Christine, who battled stage 4 colon cancer for seven years. Her vision is to help other families in her community pay for the unforeseen expenses associated with cancer like transportation, hotel stays and meals. 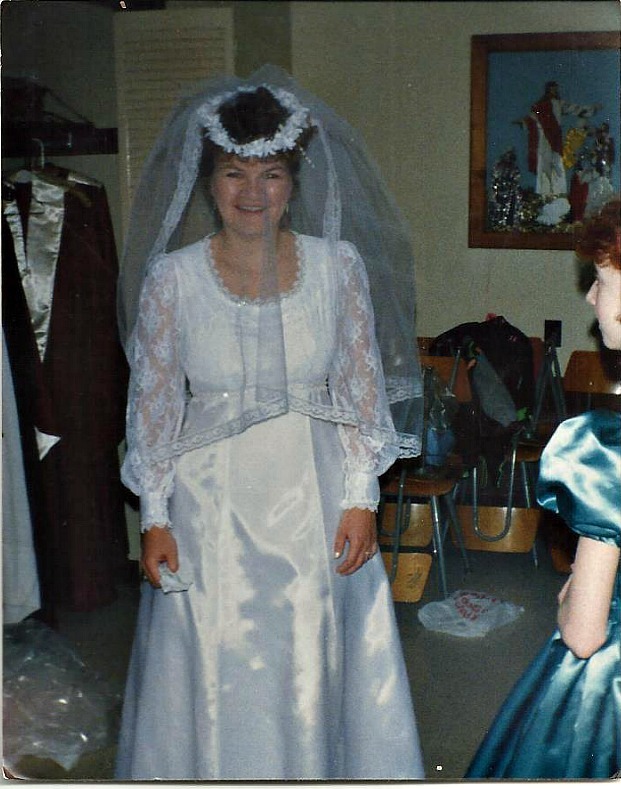 Christine passed away peacefully just a few days before this post went live. 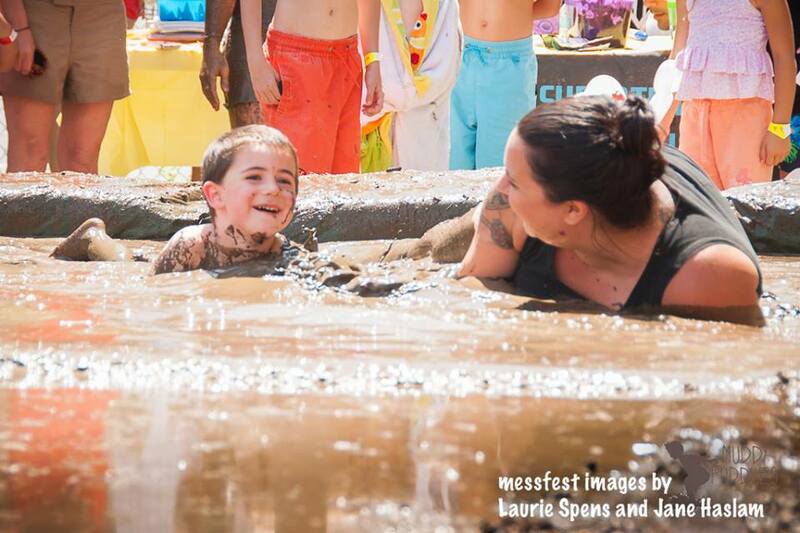 Earlier this month my family and I attended the Muddy Puddles Mess Fest to help raise funds to find less invasive treatments for pediatric cancer. It was an amazing family-friendly and kid-friendly event. It was so fun, that for a second I forgot that this event was made possible by a little boy who lost his fight at only age 5. I didn’t get into the mud- I stayed behind with my anti-messy child. But, my good friend Gloria (and partner in cancer fighting crime) jumped in with her little guy! These are just some of the events I chose to support in honor of my loved ones. I spent all these years anxious about turning 39 not realizing how lucky I am to have the last 17 years of life to worry. What a luxury it is to turn 39 today. To learn more about any of these organizations please click on the highlighted links. In honor of those still fighting. There are a lot of sayings and superstitions about the number three, such as “Third time’s a charm” or “Bad things happen in threes.” All I know is that by the time you get to baby number three, you either learn to roll with the punches or you may find yourself knocked out for the count. I can still say that for me, going from none to one was still more of a transition then going from one to two or even two to three. There is the camp that says going from two kids to three puts you at a disadvantage because now you move from a man on man to a zone defense as there are now more kids than parents. I love my husband dearly, but most of the childcare responsibilities have always been mine and since becoming a Stay-At-Home Mom I’ve made my peace with it. Without having to juggle work and childcare and household chores, it’s been easier to deal with this fact. I’ve learned that it’s ok that my husband and I have separate roles. They are different but equally important. Our lives are woven together and I can’t do my life without him and he can’t do his without me. I know all my feminist ideas from college went right out the window, but as I get older I’ve learned that there is a difference between equality and fairness. Feminism was about giving women the choice to work outside the home, but if it’s really about choice than you’ve got to allow women to make the choice to stay at home as well without judging them. I have noticed some differences going from two to three kids. Some of them are caused by adding one more person to the family and the others are a result of my altered parenting ideas and practices this time around. So every woman on the planet loathes the idea of being a “minivan mom,” but once you have three you have virtually no choice. Well there’s always an SUV, but by observing my neighbor having to load my kids in her SUV in the very back row through the trunk, I’m thinking that’s not the way I’d prefer to go. Even with a minivan it’s incredibly challenging to get everyone ready and out the door without one more feeding for the baby, three more choruses of “Put your shoes on” and a choreographed dance of who is supposed to get in the van first. It makes me wish I had a newer model minivan where you can open the doors with a remote so the older kids could climb in while I’m putting the baby in. For the most part Hannah can buckle herself which helps, but I find myself constantly holding my son Jay back so Hannah can get in first and get to the back of the van so she doesn’t have to try and climb past his legs if he gets in first. So it’ll take more coordination to get anywhere on time from now on. Daddy “helping” Jay skate. Look who has the walker. Taking a time out from skating with Sydney. Will and I took turns with all the kids at the roller skating fundraiser. Go With The Flow Or Don’t Go? I’ve relaxed my views on taking a newborn out to places. With Hannah and Jay I stayed at home for weeks. When Hannah was two-years-old, she asked me when we were going to the doctor’s next and then cried because I said not for awhile. It dawned on me that it was because the only time we seemed to leave the house was when my son had a well baby check up. This time around, I’m not quite as paranoid about germs although I still don’t let many people hold her or touch her hands or face. So far Sydney has been to church starting at a week old because mommy needs to be spiritually fed or I don’t feel like such a happy mommy. 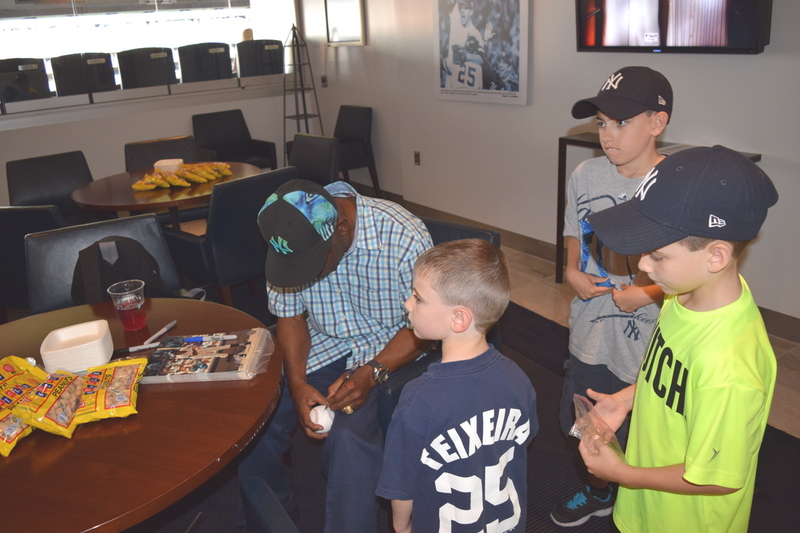 We’ve also been to the Wayne County fair, a Monster Truck Show, Red Lobster, a Hudson Valley Renegades game, and the Galleria. She actually slept through almost the entire Monster Truck show if you can believe that. Last night we had a roller skating fundraiser and you guessed it, Sydney went too. Before you pick up the phone to call CPS on me, let me at least say I considered staying home and letting my husband take the older two kids to all of these events. My husband insisted I go because the family is just not complete without me and Sydney. It’s amazing how in only a few weeks time, it feels as if she’s always been with us. If I had stayed home with the baby I would have missed out on “the greatest day of my son’s life,” which he proclaimed while watching giant trucks smashing cars. I would have missed my daughter falling repeatedly while skating but triumphantly getting up to try again. I’m glad to know my kids are willing to try new things even if it means falling, because in life it’s the getting up when you’re down that determines how you’re going to handle life’s challenges. The way I see it, I had a choice – I could revolve this family around the new baby or I could simply make her a part of it. I chose the latter and I’m glad I did. She’s perfectly fine and my kids have great memories that include the whole family. I’m super thankful to be able to breastfeed. It means I can bring my nursing cover and feed her wherever we go. What things did you do differently once you had multiple kids? Share your thoughts. Back in June 1998, I was going to take a day off of work to go see the Braves play at Yankee Stadium. It was the first time Atlanta would be at the Stadium since the Yankees defeated them in the 96’ World Series. At the time I loved Baseball more than most things in life and I really loved a good pitching matchup and wanted to see Greg Maddux. When my father found out I was skipping work to go to the game, he gave me a variation of the Sonny line from “A Bronx Tale” and told me Greg Maddux isn’t going to pay my bills. A little extreme, but a good point. With the recent passing of Robin Williams, once again I started thinking about celebrities and all the energy and effort we put into learning about their lives, paying what we pay to see their movies all for what? A few hours of entertainment, yes, but to take it any further than that is just a waste of your time. You’ll never know these people, because, well, you DON’T KNOW THESE PEOPLE. Sure Robin Williams has made me laugh (I went through a phase where I talked like Mork) he has also made me cry (Did you ever see Good Will Hunting)? But despite being aware of his substance abuse issues, I didn’t know he was depressed and had financial problems. Now we found out he had the early stages of Parkinson’s Disease. I remember, my mother telling me that River Phoenix had died. It was the day after Halloween back in 1993. There was early word that he died of a drug overdose. My initial thought was “no way! He’s a vegan that loves life”. Well, apparently he was a vegan with a heroin addiction. Again, no idea. Why did I not know this? Doesn’t watching “Stand by Me” 4,000 times qualify me as a subject matter expert in the lives of the actors who play the characters I love? Answer…no it does not. In an age where some people get to know others based on their social media profile. Are we getting to a point where we know family members and friends, actual people that are in our lives the same way we think we know celebrities? I had a family member leave us due to depression. This was just before the Facebook era, but I am pretty sure his Facebook profile would not have told me he was going to take his own life. We live in a busy world and if you slow down a second, you feel days behind. There really isn’t enough time for everything and everyone, but make time to be involved with those closest to you. If everyone does that with just one person, we’d all have someone looking out for us. Dear Lonely Mom, You Are Not Alone. I had a different, fun little piece ready to share, but when I opened my Facebook page my news feed was full of posts about Robin Williams’ suicide. My heart broke. Not because Hollywood lost a great actor, but as humans we lost a great one– his kindness, compassion, wisdom and joy now gone from this earth. Depression is a scary, unpredictable beast. There are several members of my family who live with this every single day. From seasonal affect disorder to bipolar depression to clinical depression. Not everyone who suffers from depression talks about it or even appears depressed. Many people with depression are capable of getting up every day, going to work and appearing happy and complete. No one else hears that inner voice convincing them suicide is their only option. No one is immune- not even moms. 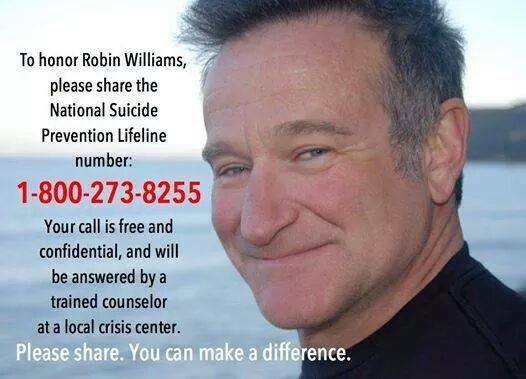 After hearing the heartbreaking news about Mr. Williams, I thought about moms who may suffer from depression. How many moms get up every day and go through the motions of taking care of their families and leave themselves last on the list? How many moms won’t reach out for fear of judgment or losing their kids? I often feel lonely in my mothering journey. There are few adults to speak with or to help navigate the difficult days. Being at the service of two demanding toddlers reminds me how difficult the days are compared to my carefree life before kids. All my single friends have moved away or feel they are intruding when asking to spend time with me. My mom friends are just as busy as me. When we get together there’s not much time for bonding between interruptions. Social media is great to keep in touch, but there are days I don’t have time to connect. Some days exhaustion overrides any emotion I have, and I go to bed feeling numb. Suffering in silence is not a safe way to live. If you think you may be depressed, have postpartum depression, or maybe you have difficulty finding joy in life please speak to your doctor right away. Please don’t worry that someone will think less of you, or that you can’t be a good mom. Taking care of your own needs is part of being a good mom. Don’t worry about what other people will think, please just worry about your own health. No one will think you’re being selfish. If they do, Whatever! They are not living your life. Most of all please don’t think suicide is your best option. It will end your pain. It will also end your joy and your tomorrows. It will leave a big whole in this world and in the lives of the people who love you. No one can replace you and the important role you have as Mom. Please call me for coffee. http://www.afsp.org/ Find local resources and resources to cope with a suicide loss, and to educate yourself on the risk factors and signs of suicide. My company recently acknowledged my volunteer efforts with Beautiful People and rewarded me with tickets to a Yankees game in their Luxury Suite. A great gesture on their part yes, but I’m not sure the word “volunteer” really fits my situation. I mean what’s my other option? Sit around and not have Luke participate in anything? I’m kind of just being a dad so Luke could just be a kid. I was a little nervous about taking the boys to the Bronx without my crutch that is my wife, but figured how hard could it be? We’re in a suite, so the kids are contained. Any father would agree that the toughest part about taking your kids to a sporting venue is the disgusting bathrooms, so that was covered with a private facility. We figured out what I will call the fastballs (Luke’s medication, snacks for the car ride), what I didn’t count on was the curve balls that were thrown my way. The walk from the car to the Stadium – simple math, I have two hands and three kids. I constantly say my children are lacking the street sense that I grew up with in Queens. It was nice that they did not see a difference in walking on River Ave as opposed to my quiet street in Warwick, but it was really bad that they did not see a difference! I would eventually round everyone up and make it to the game safely. Luke’s food allergies – this is an area that my wife usually handles. Whether it’s cooking at home or eating out, she has it covered. The suite we were at had all the food you can eat, but unfortunately it had NOTHING Luke can eat. Thanks to a very concerned suite attendant, he managed to get me three sliders, no buns, for Luke. It took me 3 innings to take care of this, but all was good once the burgers arrived. My time with my boys – My overall experience would be sent to deep center, over the wall. We never get to go to a baseball game. I haven’t been to the new Yankee Stadium prior to this. My company took care of me the way I took care of my kids. It was a late night, but one that doesn’t happen often. When I grew up, I was ten minutes from Yankee Stadium and five minutes from Shea. To say we were at either stadium twice a month is not blowing smoke, it was just so easy to do and we did it. We don’t have that luxury now or the time, but appreciate the times like this. 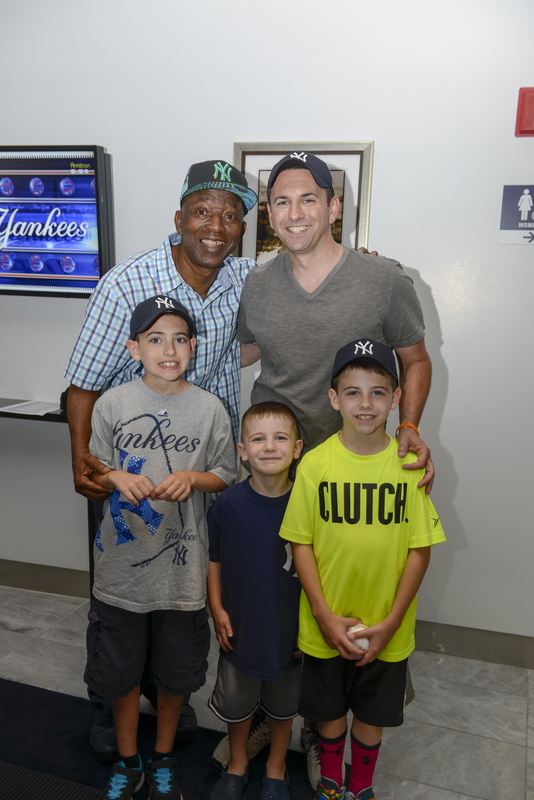 As an added bonus, we got to hang out with former Yankees centerfielder Mickey Rivers, who after 2 minutes my boys were talking to him like he was part of my family. 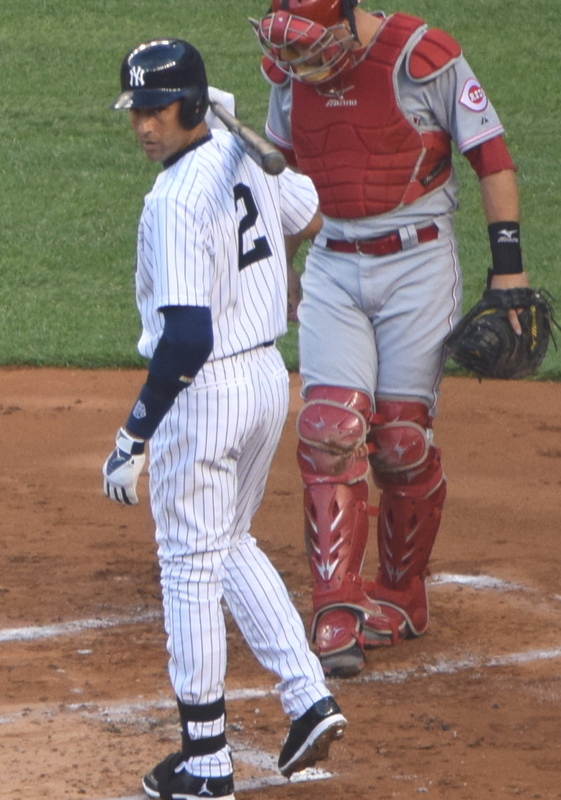 We then said our goodbyes to Derek Jeter. So on a night where I was outnumbered 3 to 1, I think I prevailed as the hero. From Shane’s face of astonishment when he first saw the size of a Major League ball field, to Luke chanting DEREK JETER! To Cole’s fascination with Mickey Rivers’ gold tooth with the star on it, it was a night to remember. So this is actually my second attempt at a blog post this week. My first was a train wreck of scattered thoughts and vague parenting advice. So today I prayed for some inspiration and as the saying goes, be careful what you wish for, but I guess that goes double for what you pray for. Today’s sermon at church talked about seeing the opportunities amidst your struggles, so hopefully this post will help another new mom out there. After a very nasty breakdown this afternoon I realized that all the randomness of this week’s events had one thing in common. They all made me cry, and not the pretty kind, the ugly raw cry of someone who just can’t seem to keep it all together. So I gave birth just two weeks ago and it both feels like the blink of an eye and a lifetime ago all at once. It’s like time slows down right after you have a baby. 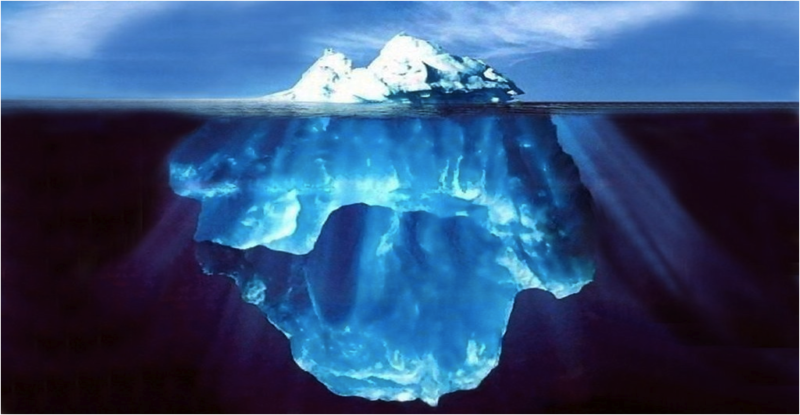 I’ve gotten the question repeatedly this week, “How are you feeling?” It’s only just this minute that I’ve actually stopped to question myself, “How do I feel?” Physically I’ve bounced back so well that my immediate response is – “I’m fine.” But what’s on the outside is really only the tip of the iceberg and you know what they say about icebergs – what you see is only about ten percent and the rest is below the surface. Here’s the run down of my crazy week. I got accused of stealing gas and had an angry stranger shout at me. I returned to the gas station to clear my name, but like I said there was some ugly crying involved as I started to sob, “I would never not pay.” One of the cashiers actually came out to hug me as I was getting into my car after they pulled up my receipt and apologized. On a normal day I don’t like being accused of something I didn’t do, but on this hormonal day I positively couldn’t hold back the tears. Then I saw my cat of 11 years being attacked by a dog right in front of my house. I yelled at the dog to get away but the damage was already done. He had crushed my cat Cesar’s pelvis and back leg and there was blood on his belly. It was a pretty awful sight, but worse than seeing the attack was the decision my husband and I had to make to put him down so he wouldn’t be in pain anymore. Telling the kids was hard and there were more tears as I watched them cry. These are the sad life lessons you never really want to teach your children. They are getting to the age where they understand death is forever. When I told my daughter about my mom’s passing two years ago I got virtually no reaction, but upon telling her about our cat she sobbed for two days straight. This is the dawn of understanding that kids go through when they finally get that life is not always fair and it certainly doesn’t come without some tears. While in Middletown today I was supposed to stop at the bank and deposit a check so we could pay the installers from Home Depot who are coming Monday to install new gutters. Wouldn’t you know that after paying for gas with my debit card and bringing two kids and a crying baby into Quick Check to grab sandwiches for lunch, I pull up to the ATM and space on my pin number. I mean it’s gone. It’s like I never used it before let alone 10 minutes ago. So after two useless attempts it locks me out and now Sydney is once again crying her little head off because she hates the car seat and I know I can’t take her out of it for at least 20 more minutes. This kicks off an hour long ugly cry to end all ugly cries. I feel stupid and useless and like the train that is my family is going off the track and I’m sitting by the wayside watching helplessly as it derails. None of my children liked the car seat so I’ve spent years listening to my babies cry their heads off in the car. I always feel so helpless when this happens since I can’t pick them up or take them out till we reach our destination. The louder, more frantic the cries become, the more I feel like I’m failing them. It’s my job to take care of their needs and not being able to do it makes me feel like an awful mom. I know in my head a little crying isn’t going to hurt them and other than being mad, they are otherwise ok, but call it mother’s guilt or blame postpartum hormones and Sydney’s car seat crying session added a special touch of UGLY to my cry-a-thon today. I’ve noticed that some of my crying jags this week had a key component – one or more of my needs weren’t being met. I was hungry, but still breastfeeding the baby or changing the baby yet holding my bladder for too long, getting the baby to nap so I could do errands while I myself am tired. The longer I ignored what my body needed, the worse the crying. I’ve spent the last two weeks getting to know my new daughter, but at the same time pretending that I could still keep everything else in my household running smoothly the way I did before she was born. What I didn’t factor in was that I’d be back on baby time. It’s been nearly 5 years so maybe I forgot that once you have a newborn, you plan around their schedule. They don’t conform to yours. The price I was paying for this mistake is small pieces of my sanity. It makes me think of the instructions you get on an airplane. In the event of a crash you are supposed to put on your oxygen mask first, but how many moms do you know that think of their needs first? Certainly not this mom. BUT of course the reasoning is true – if you pass out you’re certainly not in any position to help your children. So I guess if I want next week to be less stressful and without so many melt-downs, I’ve got to start listening to my body when it tells me what it needs. Make Bath Time the Last Activity of The Day! On really hot days we started throwing frozen ice cubes into the bath water to get a giggle. Then I froze some ice cubes with food coloring. 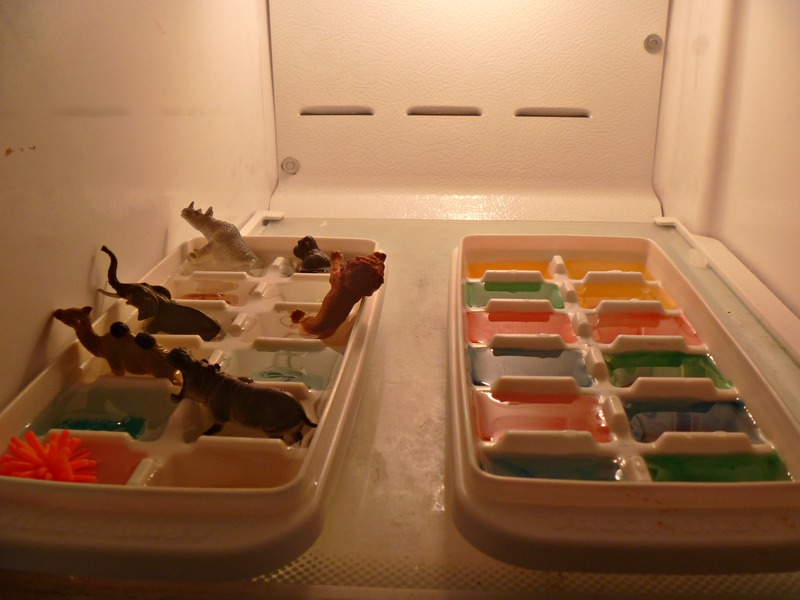 Then as a goofy surprise I added some gems and small zoo animals to the ice cubes. The kids thought this was hilarious. The food coloring will turn the water all kinds of colors as the ice melts and colors mix. 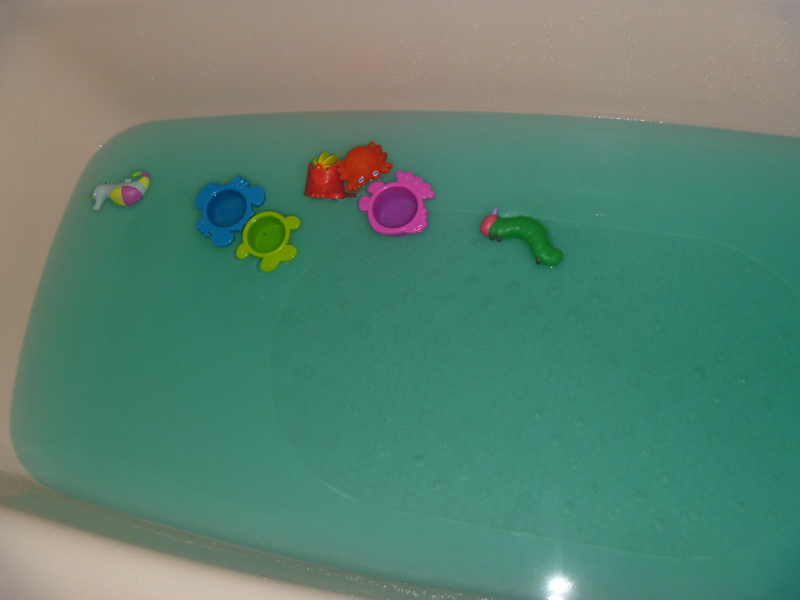 To be sure none of the color sticks to the tub or the kids, I add a little soap to the water when filling the bath. Some time ago, my friend Erin shared her recipe for bathtub paints. What a fun idea! The mess is contained in the tub and washes away completely. The girls LOVED it and beg to do this at least once or twice a week. I love this one too because it’s so easy, it cleans up quick and it buys me a good 30 minutes of quiet. 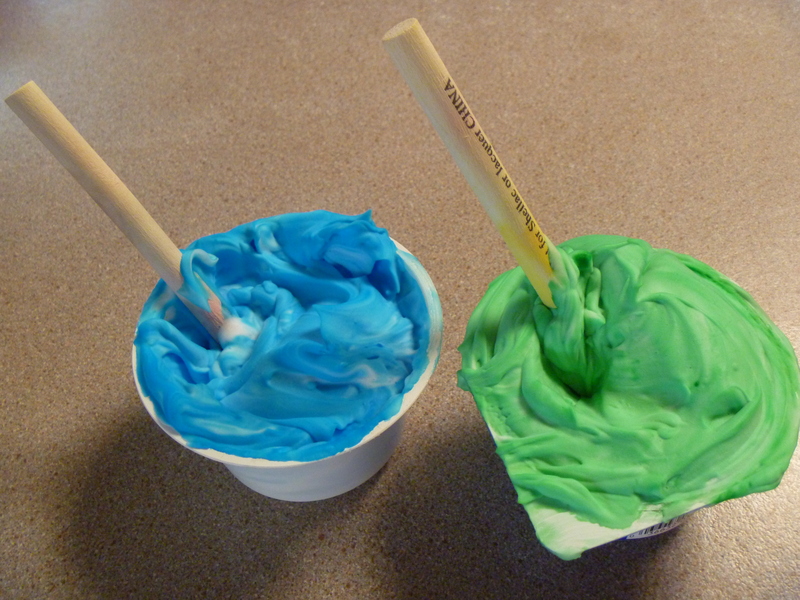 Simply dispense shaving cream into a small bowl, add a few drops of food coloring and mix. Hand it to your kid with a paint brush and let them go. We chose blue and green for an under-the-sea paint party complete with ocean blue water and seaweed on the walls. 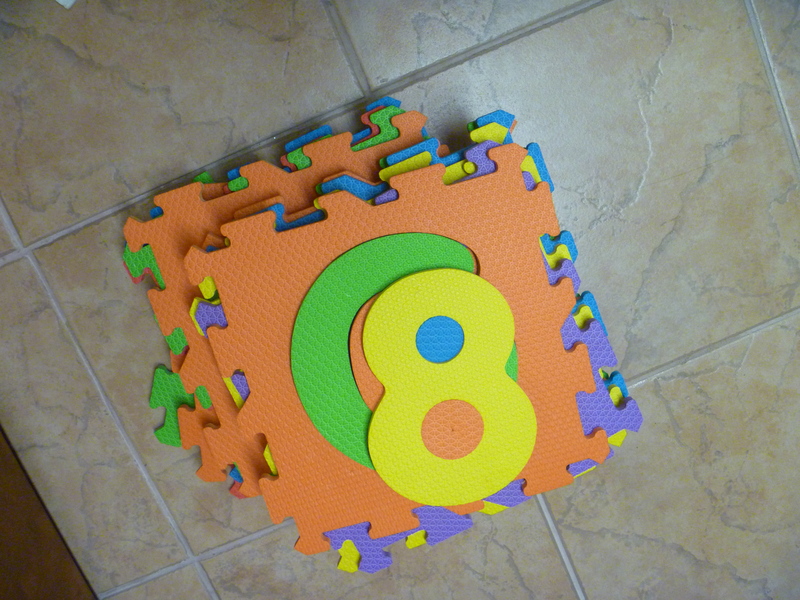 I’m not a tile expert, but so far this has not left any stains on our tile walls. I rinse immediately and spray with a homemade peroxide-based cleaner to keep color from setting into grout. (Tip- you can use this activity while on vacation to get kids into the bath after a fun filled day. Use the blue shaving gel for easy color and zero stains on grout! ).